Despite falling commodity hardware prices, the overall cost of storage continues to go up—the culprits being the need to meet robust service level agreements (SLA), fulfill data protection and compliance requirements, and the time, effort, and budget required to manage sprawling cloud and on-premises environments. There are ways of reducing the overall cost of owning storage, however. 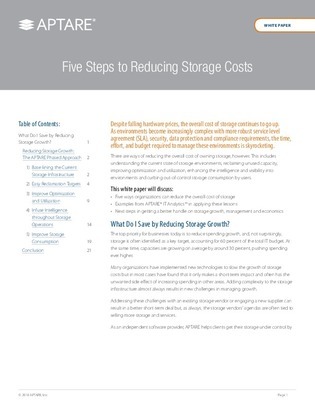 By reading this white paper, you’ll learn 5 ways your organization can reduce the overall cost of storage. It includes guidance on reclaiming unused capacity, improving utilization, and curbing users’ storage consumption.